The Turkish leader was on his second day of an “Arab Spring” tour which was obviously designed to gain Arab support for a Palestinian state application before the UN General Assembly, which meets in New York this week. Both Palestinian Authority President Mahmoud Abbas and Israeli Prime Minister Benjamin Netanyahu will state their positions in back to back addresses before the UN, Friday, September 23, setting up a confrontation between “the West’s spoiled child” and a captive population fighting to escape from a military occupation. So desperate was the US to avoid having to cast its usual pro-Israel veto in the Security Council against the Palestinian Authority/PLO application for UN membership, that it has twice dispatched its pro-Israel diplomatic team, David Hale and Dennis Ross, to Tel Aviv and Ramallah to “persuade” Abbas and Netanyahu to agree to return to negotiations. The Hale-Ross effort was a failure from the start. The two envoys returned to the region two times, knowing full well that Netanyahu would not budge from his rejection of two Palestinian preconditions for talks: Stop building settlements and start negotiations along the 1967 Green Line border, both positions advocated in previous statements by President Obama. In his Friday, September 16, televised address from Ramallah, President Abbas ended speculation that the Palestinian Authority and the Palestinian Liberation Organization (both of which he heads) might yield to US-Israeli pressure and go directly to the General Assembly, bypassing the Security Council where the Obama veto was waiting. That will not happen. Abbas is going for broke. He will present his request to the UN Security Council, fully aware that the US will veto the request. Speaking to reporters in Ramallah, Palestinian negotiator Nabil Shaath said the plan delivered by U.S. envoys Hale and Ross did not meet the two Palestinian demands. This convinced President Abbas that the US was not serious in trying to negotiate peace. One problem the Palestinians had with the American proposal was that it “did not refer to disputed Israeli settlements as illegal, instead attributing their presence to demographic trends since 1967”. This means that the two most recent Hale-Ross missions have failed, “forcing” President Obama to cast his Israel-lobby dictated, pro-Israel veto. It will not be the first veto President Obama has ordered to reject policies which Obama was on record supporting. The first Obama pro-Israel veto came February 18, blocking a resolution that condemned “Israeli settlements as an illegal obstacle to peace”. Members of Obama’s own government have tried to alert the President to the danger of giving in to Israel’s every demand. Jeffrey Goldberg wrote recently for the Bloomberg web site that Robert M. Gates, the now-retired secretary of defense, warned Obama, directly, that Netanyahu was “an ungrateful ally”. In a meeting of the National Security Council Principals Committee held not long before his retirement this summer, Gates coldly laid out the many steps the administration has taken to guarantee Israel’s security — access to top- quality weapons, assistance developing missile-defense systems, high-level intelligence sharing — and then stated bluntly that the U.S. has received nothing in return, particularly with regard to the peace process. The veto and the GA vote will guarantee that US prestige in the region, and indeed, around the world, will drop even further. And, what really distresses Israel, once in possession of a non-voting membership status in the UN, Palestine receives the right to haul Israel and its leaders before the International Court of Justice. As a result, Israeli officials will be reluctant to travel to any foreign nation, except the US, for fear of finding an ICJ official waiting for them, subpoenas in hand. This is not a good time for Obama to alienate an important part of his political “base”, those progressive and liberal voters, already disenchanted by Obama’s Bush-like foreign policy, who will find it difficult to wage a second Obama campaign of “change we can believe in”. When the US casts that veto at the UN, Obama will be rejecting an important segment of those progressive supporters who, in 2008, walked the streets for him and brought voters to the polls because they believed he would be a different kind of president. The PEPs (Progressive except on Palestine) won’t care, but peace and justice volunteers will. By sticking with his “spoiled child” ally, Obama also further reduces the influence he once coveted in the Middle East. The new power states in the region are Egypt and Turkey, both of which were once Israel’s strongest allies in the Middle East. What will we tell the world next week at the UN? What could we say? Whether in the General Assembly or the Security Council, we will be exposed in all our nakedness: Israel does not want a Palestinian state. Period. And it doesn’t have a single persuasive argument against the establishment and the international recognition of such a state. So what will we say, that we’re opposed? Four prime ministers, Benjamin Netanyahu among them, have said that they’re in favor, that it must be accomplished through negotiations, so why haven’t we done it yet? Is our argument that we object to it’s being a unilateral measure? What’s more unilateral than the settlements that we insist on continuing to build? And thus we see the contradiction which is Israel — forever pumping itself up, flexing its muscles and showing its neighbors that no one should risk messing with the mighty Zionist state, yet all the while knowing that without the protection of the United States, Israel’s survival would depend on a revolutionary transformation. Absent American protection, Israel, for the first time, would have to seriously take on the challenge of getting along with its neighbors and not, as it has for the last two decades, simply use diplomacy as a facade behind which it can pursue its policies of territorial expansion. Is the “West’s spoiled child” ready to grow up? And is the United States ready to see that its own patronage is what has allowed the Jewish state to trap itself in such a prolonged adolescence? There is no way that a Republican president would do anything other than continue to enable Israel in its behavior as the “spoiled child of the West”. It therefore, remains for our incumbent Democratic president to put a stop to this knee-jerk Israel indulgence, either in this term, or in his second term. The president should start by, first, firing those members of his White House team who have consistently favored Israel in his current and in previous administrations. He must fire the team that put him in the position of contradicting himself not once, but twice in seven months, by vetoing resolutions he supports. In the city of Washington, the President will have no problem finding experienced and able replacements who not only understand the difference between “illegal Israeli settlements” and “demographic trends since 1967”, but who grasp that difference both intellectually and existentially. 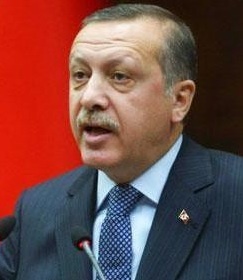 The picture of Turkey’s President Recip Tahyyip Erdogan is from the Associated Press. If nothing else, this UN bid for statehood will wrest this out of US/Israeli hands and place it where it belongs: real diplomacy in the UN arena. For this reason alone, the Palestinians can’t lose. There’s no chance Obama will take the wise advice of firing members of his team who favor Israel with an election coming up so soon. President Obama is an advocate for change. Let’s pray for a miracle. Perhaps at the last minute he will change his mind about using the veto. Exceptionally clear and rightfully tough! What do you think about Cynthia Tucker’s clear and tough analysis of the 9th district vote in New York City? She made it verbally as part of an MSNBC panel last week, namely, that the surprise of a Republican victory in the special election has everything to do with the Jewish “gotcha” response to the uncharacteristically tepid support of Israel’s settlement policy by the Obama administration. What more is to come, thanks to the Zionists? A Tea Party president next time around? Maybe Tucker has written more in The Atlanta Constitution, but chances are she was silenced. Along with any similarly frank analysis. Americans need to sign a petition for Palestinian statehood. Yes, indeed, let’s pray that Obama willl change his mind and see that an abstention is probably his best choice now IF he cannot bring himself to vote FOR the resolution.. I feel no need to write on this topic, you have addressed it very well. So, I will share it everywhere now. Thanks James. A few years back as a candidate for president, Mr. Obama carefully explained why he abstained (or refused to vote) in the IL Senate several times, even when the majority voted in favor of something. I pray that he will find the courage to remember and do that again. Prayer is powerful. The United States, also, needs to grow up in the global arena. We can’t always demand to have our way. Hard as it will be on us, we need to face the music and see that world public opinion can’t be bought or sweet talked. It requires consistency in speech and making a strong position clear to friends and foe alike. We do Israel no favor with this veto. Thank you, Jim. Notice how mainstream US media keeps on referring, in unison (by AIPAC design), to President Obama’s “V-O-W” to veto a Palestinian State application. But the same media does not refer to Obama’s speach advocating a Palestinian State, in 2011, and based on the 1967 borders, as a “Vow”. The fake rationale, imposed by Israel on the US superpower, is that “only direct negotiations” can lead to a Palestinian State. Palestinian President Abbas has already refuted Israel’s fakery, by stating that negotiations will be the first priority of a Palestinian State. Netanyahu wants “negotiations” for only one purpose: To build more illegal Israeli settlements and import more illegal and violent American and Russian settlers in East Jerusalem and the West Bank. President Obama has the choice of upholding US interests, to which he is sworn, or supporting tyrannical Israeli Apartheid in the Holy Land. As usual, James is right on the money. Our Indiana Center for Middle East Peace hosted Stephen Zunes in Fort Wayne awhile back and as critical as he was of Obama’s tepid, at best, support of Palestinian aspirations, he laid part of the blame on us, rightly so, I believe, when he said that “there needs to be a critical mass of the population to give President Obama ‘permission’ to do what he believes in his heart is right but that he can’t politically afford.” I believe that this is sage advice; hence, those of us in the just peace network need to continually step up our game, especially in the progressive churches (a good example of this is the recent Presbyterian decision on divestment – thanks to Noushin Framke and others). Jim: Unfortunately, President Obama does not have the political courage to do anything but buckle under to the to policies of Benjamin Natenyahu. He is so fearful of Israel and the political consequences.of standing up to Israel. It is a very sad story. Harris Fawell, Member of Congress (retired in 19998). of West Palestine where the other human beings are living in a mighty heaven. Let that tourist cross the bridge westward and watch the human saga, and let the tourist wait at the check points for the flash light of a young Isreali soldier to control masses of human being from going to where they want to with humiliation, no water, no WC at the check point, and who dares to leave his car to ask for mercy on the suffering children, the sick and eldery to relieve them or to let them go to the nearest hospital. Let the tourist go to Al Aqsa Mosque and see how people are forbidden from praying for Peace, and finally let that tourist show his American pasport and say “We Americans support you , and he will be met with an ungrateful answer like that of the Ungraetful Nat. Hu. This should happen before the Palestinians submit their application for their rightful right. By the way was not Israel created by the UN? If the trip happens then Presiden Obama or his disguised advisor should ask not only for Mercy on the Palestinians but VOTE For a Palestinian State. One hopes that these posted messages and worold opinions reach to Mr. President. Very well stated Jim. As I have always said, What are we (President Obama) afraid of? If we can get an answer to that question,maybe, just maybe, the Palestinian people will finally get their just due! I feel betrayed by Obama’s unwillingness to stand up to PM Natenyahu. What have we accomplished by supporting Israel? The wrath of the Arab world and a low standing among many nations. How can such a small country have us by the tail? Our voices for freedom for Palestinians must become louder. Likud’s own platform, easily accessible on their webpage, will not recognize a Palestinian state west of the Jordan River. Which means the nation, Jordan is the Palestinian state as far as Likud is concerned. To continue the tired old saw of continuing negotiations is to continue settlement expansion. What we are witnessing is analogous to the settlement of the US by the Europeans who simply shoved the native indigenous peoples onto reservations.